A break-up forces us to re-examine our relationships, not just with former partners but with other family members and new people who enter our lives. It also forces us to re-examine ourselves. Whether or not you choose to enter into another love relationship, consider making the decision to re-couple after you have learned to love yourself and understand your strengths and weaknesses. Many of those who are marrying again end up in divorce because one or both partners were on the rebound from a previous relationship. Any relationship has a better chance of survival if you enter feeling strong in all areas of your life. Take your time in establishing a relationship. Fully explore how the new person in your life feels about a 50-50 partnership in living together, married or unmarried, before you decide to partner again. It’s even more important when re-coupling. Whether you are considering moving in with a new partner or marrying them, consider the legal rights you are allowed, both in your relationship or at its end. 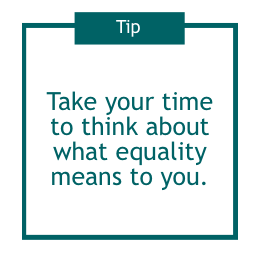 Consider which arrangement you would are engaging in a what kind of agreement about equality you and your partner would prefer. Refer to financial information for yourself on the You and Your Money page and legal information for your new partnership on the Before Cohabitation and Marriage page. Profit from past mistakes by acknowledging them. Don’t seek out a carbon copy of your former spouse – or an exact opposite. Evaluate each person who enters your life as an individual. Take steps to establish equality in your new relationship. Use legal contracts to formalize equality in long-term relationships. Consider courses and retreats to prepare the two of you for a lasting relationship. Avoid extreme changes in your lifestyle. Strengthen ties with friends and family as you move in new directions. Make sure you and your new love share the same commitment to equality in marriage. Use our Equal From the Start workbook to help you and your partner navigate through the most important commitment of your lives.